In 1994, the United States, Canada, and Mexico ratified the North American Free Trade Agreement (NAFTA), effectively making North America a tariff-free trade zone. NAFTA aimed to generate economic growth, expand exports, and create well-paying jobs. In many ways, NAFTA proved to be successful. In their 2012 report, the U.S. Chamber of Commerce concluded that “NAFTA has been a boon to the competitiveness of U.S. manufacturers” and that “NAFTA has been a bonanza for U.S. farmers and ranchers . . . .” Indeed, NAFTA supports millions of good jobs, raised the standard of living, and enhanced the competitiveness of the North American industry in a changing global economy. In fact, trade with Canada and Mexico supports nearly 14 million American jobs. According to the Bureau of Labor Statistics, NAFTA caused American manufacturing output to increase by seventy-three percent between 1993 and 2011 based on value-added to products and 800,000 new jobs were created in the four years after NAFTA was signed. The U.S. Chamber of Commerce estimated that exports to Canada and Mexico generated $36,000 in annual export revenue for every American factory worker. As a result, any loss of jobs was due to shifts in productivity attributed to technological change, automation, and new information technologies as opposed to NAFTA. The Trump Administration announced in early 2017 that the U.S. would either withdraw from NAFTA or attempt to negotiate its terms. Most of the negotiations have centered on updating NAFTA’s provisions, including new regulations on digital trade and telecommunications, updating the customs process, and aligning regulations within the three countries. Yet, American negotiators have not provided specific language for a new NAFTA agreement, and without specific language on major policy goals there has been slow progress in renegotiating NAFTA. This article examines the Trump Administration’s stance on NAFTA. The first section addresses whether the U.S. desires to modernize NAFTA or is simply insisting on terms that are politically impossible for Canada and Mexico to accept. And in the second section, I will assess the legal and political obstacles surrounding withdrawal and whether the President can unilaterally withdraw from NAFTA without Congress’ approval. The U.S.’s proposals have caused contention between the three nations. Robert Lighthizer, the U.S. trade representative, included proposals that have been long-standing demands of NAFTA critics. One such proposal is for the countries to leave the investor-state dispute settlement (ISDS) scheme, where companies can sue governments for lost expected profits from changed regulations. Lighthizer’s proposal would not eliminate the ISDS, but would allow countries such as the U.S. to leave the system. Lighthizer also seeks to strengthen the “Buy America” procurement mandate that would increase the “rule of origin” for automobiles so that eighty-five percent of a vehicle is made in a NAFTA country and fifty percent of that same vehicle in the U.S. And most controversially, the U.S. proposed a mandatory sunset clause and review of NAFTA every five years. The Trump Administration may find itself caught in a peculiar bind as a result of its proposed changes to NAFTA. While ending NAFTA would remove some incentives for companies to outsource, it would also entail economic loss and lower competitiveness for American goods. The better method to revitalize American manufacturing would be renegotiating NAFTA and crafting a deal that includes the benefits of free-trade without the problem of outsourcing. But if there is no agreement in the coming months, the Trump Administration could give the required six month notice prior to withdrawal under NAFTA. Yet, it is unclear whether or when there would be a withdrawal. If there is a withdrawal, some experts believe that Trump could act unilaterally, while others conclude that Congress would have to pass a law to rescind an agreement that Congress previously approved to adopt and implement NAFTA back in 1993. Congress specified the termination of NAFTA status when it ratified the agreement through the North American Free Trade Agreement Implementation Act. Accordingly, under 19 U.S.C. § 3311, “During any period in which a country ceases to be a NAFTA country, sections 101 through 106 shall cease to have effect with respect to such country.” Furthermore, NAFTA Article 2202 provides that “the parties may agree on any modification of or addition to this Agreement.” Both Congressional legislation and NAFTA itself provide internal mechanisms to modify or terminate NAFTA status. Concerning withdrawal, NAFTA Article 2205 provides that a country can withdraw from the Agreement “six months after it has provided written notice of withdrawal to the other parties,” and the same provision states that NAFTA shall remain in force in relation to the other parties. However, neither Congress nor NAFTA specify if the President may act unilaterally and whether withdrawal also terminates implementing legislation. Some experts believe that Section 125 of the Trade Act of 1974 authorizes the President to unilaterally withdraw from trade agreements. Similarly, the President has the authority to withdraw from treaties without congressional consent. However, there is one glaring difference. Trade agreements are different from treaties because the Constitution assigns power over areas of foreign trade and tariffs to Congress, not the President. Thus, the President may withdraw from international agreements without Congressional authorization, but the President cannot constitutionally ignore or cancel domestic laws passed by Congress through withdrawal from such international agreements. Even if the U.S. withdrew from NAFTA, the North American Free Trade Agreement Implementation Act would remain in force unless Congress passed a law to repeal it. Basically, the President would remain bound by federal law in setting tariffs that comply with NAFTA and therefore cannot unilaterally repeal a statute. Instead, Congress may delegate authority to set tariffs and governance over foreign commerce to the President. Under the non-delegation doctrine, Congress must establish clear standards to guide the President when he exercises delegated authority over foreign commerce. This is a sharp contrast to the presidential power over international affairs found in the Constitution. Under Article II of the Constitution, the President has the authority to negotiate with foreign countries on behalf of the U.S. When it comes to negotiating treaties and conducting international affairs with foreign nations, the President may act unilaterally. But in the areas of trade agreements and foreign commerce, Congress is preeminent and may only delegate some authority to the President. If the President renegotiates NAFTA, the implementation of the negotiated agreement in domestic law would take two forms: Presidential proclamation or expedited treatment of implementing legislation under the Bipartisan Comprehensive Trade Promotion and Accountability Act of 2015 (TPA) in order to change domestic law. One or more existing duties or any other import restriction on any foreign country or the United States or any other barrier to, or other distortion, of international trade unduly burdens or restricts the foreign trade of the United States or adversely affects the United States economy . . . . The President has the authority to negotiate and enter into agreements with foreign countries in order to correct restrictions and promote free trade with the U.S. Yet, the TPA only grants the President the ability to begin the process of renegotiation. To formalize any agreement would require Congressional approval and implementing legislation from Congress. Trump could withdraw from certain parts of NAFTA without congressional consent, but partial withdrawal would have little effect on trade or investment with Canada or Mexico. Large portions of NAFTA would remain unchanged, including government procurement, labor and environmental conditions, services trade, and arbitration proceedings. Even if the U.S. withdrew from NAFTA, Trump would only be able to raise tariffs to levels agreed under the World Trade Organization (WTO). NAFTA would remain because it was implemented by congressional statute. As a result, the WTO could hear challenges by other countries against the U.S. because they could claim that Canada and Mexico received special treatment due to American domestic law treating Canadian and Mexican goods as though NAFTA was still in force. The Constitution supports this view that only Congress could regulate trade agreements. Article I, Section 8 provides that, “The Congress shall have Power to lay and collect Tax, Duties, Imposts and Excises, to pay the Debts and provide for the common Defense,” and “regulate commerce with foreign Nations.” Basically, trade agreements are not treaties. Unlike a treaty, a trade agreement is not self-executing, does not require two-thirds Senate approval, and does not have the same force of law upon ratification. Instead, trade agreements are considered congressional-executive agreements, where the President signs the agreement and Congress puts into effect through implementing legislation that is finally signed into law by the President. In this regard, the Trump Administration would need Congressional approval to either overturn the current version of NAFTA or implement a revised version. The Trump Administration has not provided concrete proposals for negotiating contentious issues with Canada and Mexico. Instead, Trump stated that NAFTA is the “worst deal ever made” without addressing what percentage of the product must be made in North America for it to qualify for free-trade status, dispute settlement involving foreign investors, changing Mexican labor standards, or how it aims to reduce trade deficits with Mexico. Currently, the trade deficit with Mexico stands at $64.4 billion, or about six percent of the Mexican economy. It is unrealistic to erase the trade deficit because it would lead to contraction of the Mexican economy. Such an event would open the floodgate towards economic instability and increase immigration to the U.S. Because of these possible consequences, Mexico has declared that supposed proposals that reduce the trade deficit or change the rules of origin standard are redlines and not open to negotiation. On this point, there is no mechanism to eliminate the trade deficit, because it depends on the market conditions; it would be difficult to write such a provision into any final agreement. Furthermore, the trade balance is changing between the U.S. In recent years, Mexico has opened its state-run oil and gas sector to foreign companies and investment. American exports of natural gas have steadily increased to Mexico as new pipelines and supply chains are constructed. As such, restrictions on trade between the U.S. and Mexico could be disastrous considering that both countries are inter-dependent for a myriad of goods and services. There are also many potential issues Canada could face should NAFTA be repealed. Under the current version of NAFTA, 62.5% of the value of an imported vehicle must originate in Canada, Mexico, or the U.S. for that vehicle to receive duty-free access to North America. According to data from the National Highway Traffic Safety Administration, American and Canadian vehicle content combined accounts for twenty-four percent of the total value of vehicles exported from Mexico to the U.S. The Trump Administration is considering an American-only content requirement ranging from thirty-five to fifty percent for vehicles to receive duty-free access into the U.S. This proposed requirement would put pressure on Canadian vehicle manufacturers because American parts would have to constitute a larger percentage of the total vehicle value, reducing the number of Canadian parts in that same vehicle. The U.S.’s insistence on eliminating special courts created under NAFTA to review and adjudicate anti-dumping or countervailing duties could heavily effect Canada. The U.S. has argued that these special and transnational courts for investment disputes encroach upon its sovereignty and are therefore illegitimate. Canada has sought to preserve these special courts to combat against unfavorable American trade policies. For example, the Trump Administration recently placed a 219% tariff on Canadian jetliners to block a sale to Delta. Canada has made clear that these special courts constitute a red line and are necessary to restrain American measures against Canadian goods. Policy experts and economists cite NAFTA as a key factor in the expansion of trade and economic linkages in North America, creating efficient production processes, availability of lower-priced consumer goods, and improving livings standards and workings conditions. Yet, others blame NAFTA for worsening employment trends, declining American wages, and not fully addressing labor violations and environmental protections abroad. Whatever the case may be, NAFTA influenced other free trade agreements and changed North America. 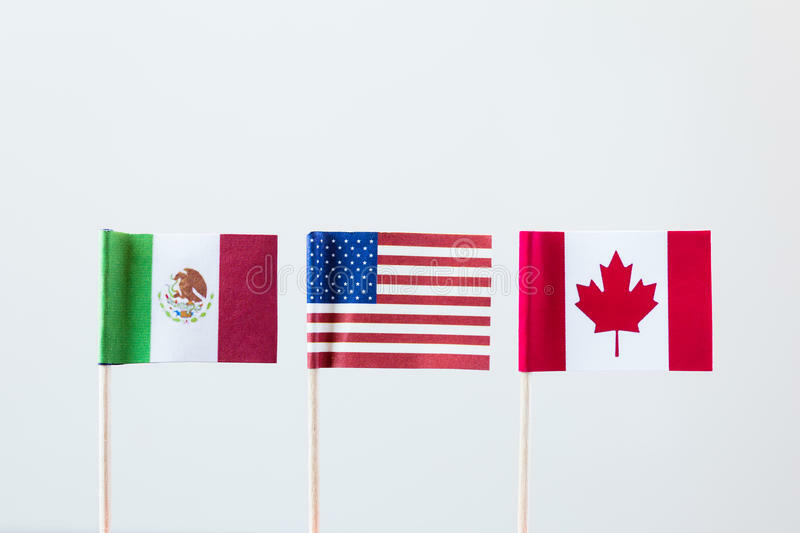 U.S. trade with Canada and Mexico tripled following NAFTA, where both Canada and Mexico account for thirty-four percent of total U.S. exports and twenty-six percent of U.S. imports in 2016. As a result, the U.S. imports motor vehicles and parts, crude petroleum, and computer hardware products from its NAFTA partners. Ending NAFTA would uproot these economic linkages. Canada and Mexico cannot ignore the U.S. in creating their own bilateral trade agreement. Simply put, both countries need access to American markets as well as physically transporting goods through the U.S. to reach each other’s markets. This has given Trump leverage in threatening to withdrawal from NAFTA unless Canada and Mexico accept terms beneficial to the U.S. Yet, there is something missing in this discussion. NAFTA is beyond trade and economics. NAFTA represents international cooperation. Imposing an unfair NAFTA agreement or sudden withdrawal can sow the seeds of mistrust among Canada and Mexico, which would undermine American influence and reputation. * Luís L. Lozada is a J.D. candidate at Cornell Law School where he is a Cornell International Law Journal Associate. He holds Bachelor’s Degrees from UCLA. U.S. Chamber Com., NAFTA Triumphant: Assessing Two Decades of Gains in Trade, Growth, and Jobs (2012), https://www.uschamber.com/sites/default/files/legacy/reports/1112_INTL_NAFTA_20Years.pdf [hereinafter Triumphant]. Ana Swanson, How the Trump Administration is Doing Renegotiating NAFTA, N.Y. Times (Sept. 28, 2017), https://www.nytimes.com/2017/09/28/business/how-the-trump-administration-is-doing-renegotiating-nafta.html?_r=0. Daniel Dale, Donald Trump’s ‘Outrageous’ Demands Put NAFTA Negotiations at Risk of Collapse as Talks Resume Wednesday, Experts Say, The Star (Oct. 10, 2017), https://www.thestar.com/news/world/2017/10/10/donald-trumps-outrageous-demands-put-nafta-negotiations-at-risk-of-collapse-as-talks-resume-wednesday-experts-say.html. David Dayen, Trump is Playing a Fascinating Game With NAFTA Negotiations, The Nation (Dec. 14, 2017), https://www.thenation.com/article/trump-is-playing-a-fascinating-game-with-nafta-negotiations/. North American Free Trade Agreement Implementation Act §109, 19 U.S.C. 3311 (1993), https://www.gpo.gov/fdsys/pkg/STATUTE-107/pdf/STATUTE-107-Pg2057.pdf. M. Angeles Villarreal & Ian F. Fergusson, Cong. Research Serv., R42965, The North American Free Trade Agreement (NAFTA) (2017), https://fas.org/sgp/crs/row/R42965.pdf [hereinafter NAFTA]. Matt Ford, How Easily Could Trump Withdraw the U.S. From NAFTA?, The Atlantic (Apr. 26, 2017), https://www.theatlantic.com/politics/archive/2017/04/trump-nafta-withdrawal-order/524463/. Tim Meyer, Trump’s Threat to Withdraw from NAFTA May Hit a Hurdle: The US Constitution, The Conversation (Aug. 15, 2017, 9:37 PM), https://theconversation.com/trumps-threat-to-withdraw-from-nafta-may-hit-a-hurdle-the-us-constitution-81444. Id. In Clinton v. City of New York, the Supreme Court ruled that Congress cannot delegate to the President authority to unilaterally repeal a statue, thus, Congress struck down the Line Item Veto Act (allowing the President to sign a bill into law then unilaterally cancelling or removing individual spending provisions within the new law). See Clinton v. City of New York, 554 U.S. 417 (1998). See Bipartisan Congressional Trade Priorities and Accountability Act of 2015 § 103 19 U.S.C. 4202 (2015), https://www.congress.gov/114/plaws/publ26/PLAW-114publ26.pdf. Zeeshan Aleem, We Asked 6 Experts if Congress Could Stop Trump From Eliminating NAFTA, Vox (Oct. 26, 2017, 1:40 PM), https://www.vox.com/policy-and-politics/2017/10/26/16505508/nafta-congress-block-trump-withdraw-trade-power. Quinn Emanuel Urquhart & Sullivan, Renegotiation of, or Withdrawal From, NAFTA: Context and Possible Consequences (2017), https://www.quinnemanuel.com/the-firm/news-events/article-april-2017-renegotiation-of-or-withdrawal-from-nafta-context-and-possible-consequences/. Steven Mufson et al., Trump Twitter Bombs and A Negotiating Standoff: How NAFTA Talks Could Fail, Wash. Post (Oct. 6, 2017), https://www.washingtonpost.com/business/economy/trump-twitter-bombs-and-a-negotiating-standoff-how-nafta-talks-could-fail/2017/10/06/96b25f68-a91b-11e7-850e-2bdd1236be5d_story.html?utm_term=.ea5392e86cb9. Franco Ordonez, Trump has Leverage Over Mexico and Canada as NAFTA Talks Start, Sacramento Bee (Aug. 31, 3:01 AM), http://www.sacbee.com/news/politics-government/article170263767.html.